All summer I’ve been meaning to write to you and tell you how wonderful Hope was doing and now I am writing to tell you that this morning during a routine dental cleaning she went into heart failure and passed. We are devastated. Dr. Roberts of Hillside Veterinary was doing her cleaning. She was healthy, so we are unsure as to what happened. Once my mind has settled some I hope to find out better what went wrong. Her heart was as big as all outdoors. She loved everyone and everyone loved her. Her work as a Therapy pet was her joy. I had visions of being with her for so many more years! Remember her today as she heads for the Rainbow Bridge. Thank you for bringing her into our lives, though my heart is breaking right now, I know I am better for the time she had with us. Hope arrived at our home on May 25th, 2008. Just two short days later, Hope joined my husband, Thomas, on his daily duties as Chaplain for Country Meadows of Frederick. She took to her life as “Assistant Chaplain” immediately! The nuts and bolts of becoming a Therapy Pet are pretty simple. Thomas and Hope took the obedience class, Patty, our trainer, went online and downloaded all the information on Therapy Pets, Inc; including their testing procedure. Patty was able to conduct the test for us, as there are no Therapy Pet, Inc, testers in this area. We then obtained 3 letters of reference, had our vet sign that all of Hope’s shots were up to date and sent it all to Therapy Pets, Inc in Cheyenne Wy. Country Meadows requires that Hope also have the AKC Good Citizen certification and we will do that at a later date. Being a part of Therapy Pets, Inc not only offers Thomas & Hope liability coverage for the off campus visits, it also offers the facilities she will visit the assurance that Hope is trained and that her medical records are current. Therapy Pets, Inc also offers points and tips on how to train your pet to be a therapy pet. While Hope was going through obedience classes, she continued to go to work daily with Thomas. Initially we simply had Hope accompany Thomas wherever he went. Hope had an immediate impact on the Dementia/Alzheimer’s unit. Within the first week Thomas saw residents who had become nonverbal, speak and residents who had become withdrawn, reach out to pet and talk to Hope. Hope is very loving and seems to have an intuition of who needs her presence. Just walking her through a room brings peace and calm to many while engaging others! We also saw a change in residents in assisted living as well. Hope’s presence relaxes folks. They are more comfortable sharing their lives with those around them. Much of what Hope does comes naturally to her. We have not had to train her to be patient with residents or to side step a wheel chair or walker. Her graceful and patient manner lends her to be a wonderful therapy pet. Her favorite thing to do is to put her head in your lap and just stand there to be petted! This is a hit not only with the residents, but also with the staff! I titled this article A Time For Hope because that is the name of the program begun by Thomas and Hope within the dementia unit at Country Meadows. Hope lives up to her name. She not only brings it but, in this her forever home, she lives it! We are saddened by Hope’s loss way before her time. 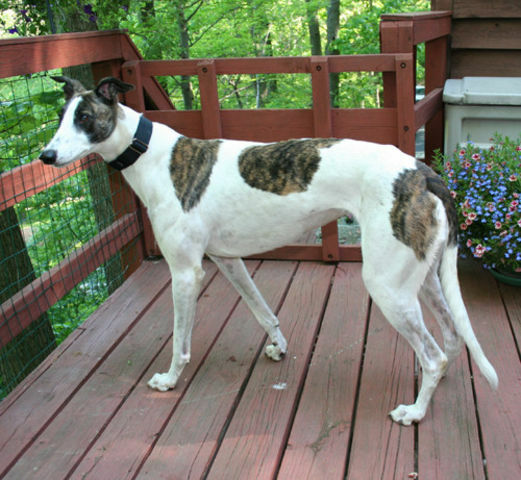 But we know that she had the most wonderful home any greyhound could have; that is all we hope for when we place a dog. Godspeed Hope, you were greatly loved by many.